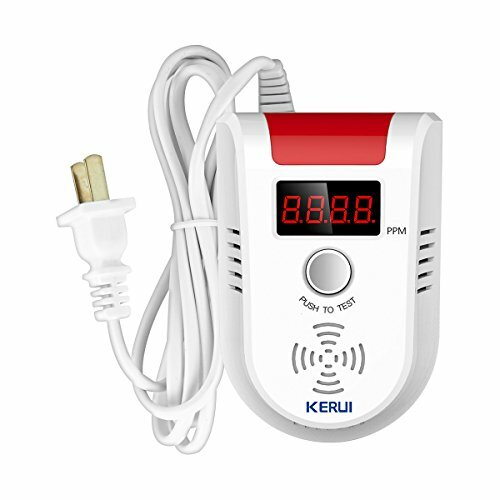 This Gas Detector can work with the alarm system in our KERUI alarm but we can not make sure whether it can work with other alarm on Amazon, if you want to order this item to work with other system,please send some pictures or web link of the system in your hand to decide whether it can work with our wireless keypad,thank you. 1.The gas detector is easy to be effected by the sharp pounding and shock in transit or installation, lead to not work. 2.This is a Combustible Gas Detector, can not detect the poisonous gas such as CO.
3.Scheduled maintenance: surface cleaning per month, specialist inspection per half year. 4.Do not use the detergent to clean the gas detector, this will damage the gas detector. 5.Do not spray any sprays such as air freshener, hair spray,etc. Avoid installing the detector close to the following sources of interference: direct air flow from vents, fans, doors, windows, sources of steam,oil vapor,etc. All wires installation must accord with the national and local effective laws and criteria.The wires must have the suitable size and colorful marks for avoiding connecting error. And unsuitable connection of wires will result in the alarm error while gas leaking happened. NOTICE: It has been insulated when bale the item. After receive the item, need remove insulation paper by the side of the battery before use. The gas sensor is a smart combustible gas detector with voice prompt, microprocessor control, support displaying of the gas concentration. When trigger the gas detector, it will alarm with build-in siren, send notifications to the wireless alarm system and close the relay output at the meantime. This detector adopt catalytic combustion method sensor which is stable and reliable. It keep the place safe from the threats of combustible gas such as liquefied petroleum gas, natural gas, methane, etc. If you have any questions about this product by KERUI, contact us by completing and submitting the form below. If you are looking for a specif part number, please include it with your message.